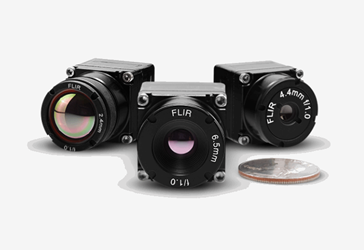 FLIR offers the Boson® longwave infrared (LWIR) thermal camera using XIR™ expandable infrared video processing architecture to enable advanced image processing, video analytics, peripheral sensor drivers, and several industry-standard communication interfaces while maintaining low power consumption. Setting a new standard for size, weight, and power (SWaP), this core includes a 12µm pitch vanadium oxide (VOx) uncooled detector in 640 x 512 or 320 x 256 resolutions. The Boson thermal core is available with many different lens options, making the weight and length dependent on the desired FOV and shutter options. These camera cores are also offered with wide configurability for faster development and lower cost-to-market. For additional features and specifications on the Boson cores, download the above datasheet.